Space Run - PC Games Trainer and Cheat Codes. You are captain Buck Mann, the most fearless, daredevil and the most broke of all the pilots in the galaxy! 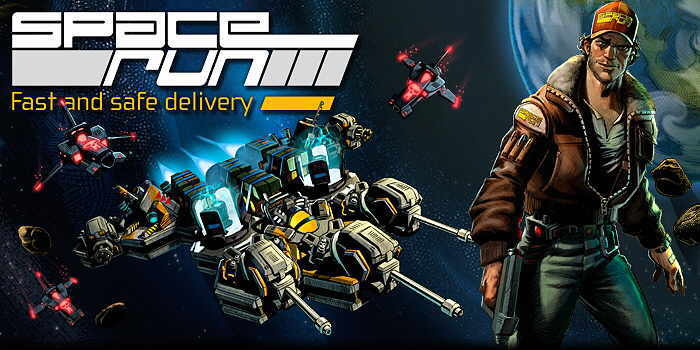 Your new job: you are a Space Runner, one of the space haulage contractors whose job is to transport valuable cargo from one end of the galaxy to the other... and one thing's for sure: it's going to be a bumpy ride. Not only do the cosmic highways regularly pass through asteroid belts of all sizes, but they are also used by dangerous and unscrupulous pirates armed to the teeth, whose fighters and battle cruisers will make short work of your transport vessel if you're totally unprepared. And finally, you will also encounter other galactic "drivers" with whom you are fiercely competitive, so take this opportunity to give them a friendly blast from your turbo lasers when you overtake them! Trainer for the game Space Run, you can use it to activate these essential Cheat Codes: Infinite Ship Health, Add Reputation, Add Credits. Note: This cheat tool is for the original version v1.0 of the game Space Run.